Congratulations! 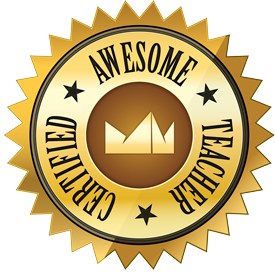 You’re a Certified Awesome Teacher! The article described each phase a new teacher typically encounters at various points during the school year. She starts off on an emotional high, anticipating a great year of teaching her rosy-cheeked, bright-eyed, motivated students. By mid-September, however, her attitude toward teaching begins to take a nosedive, as she enters the survival stage. She realizes that she and her students aren’t quite living up to the unrealistic expectations she had at the beginning of the school year. She is simply doing her best to survive the challenges her students present and make sure she has lesson plans done at least one day ahead of time. She begins to wonder why everything is taking so long and she has to stay up until 2 AM just to be prepared for the next day.